The Reykjavik Marathon was one of those marathons that has always been on my bucket list to do. It wasn’t anything in particular about the race that drew me (though I had heard a lot of great things about it) but Iceland itself has always been of interest to me. Since I was in Europe and my schedule had a hole in it for that date of the marathon, I quickly decided to sign-up and experience it for myself. Reykjavik is known to be one of the safest, cleanest cities in the world. Iceland has a 99% literacy rate, as well as many people that speak excellent English. In addition, the people of Iceland are very proud of their Viking heritage and it can be seen throughout the country as subtle reminders of their Viking ancestry. Supposedly, every Icelander can tracer his/her lineage back to the Vikings. Pretty cool! The expo and starting line are at separate locations. The distance between the two is no more than about 3 miles. The expo is located in the Laugardalshöll Sports Hall and the start/finish area is near the City Hall. Both places are easy to reach and there are hotel options that are located between the two points. The biggest fault I had with the organization and setup was that parking was not clearly marked. I drove along the main road and was able to drive just shy of the starting area but they only had barricades up – no parking signs or directions. In the handbook that was handed out (which was excellent, by the way) they did not identify parking areas either. I did find a pretty nice spot .5 mile away but I was trusting that I was in a place that would not see my vehicle get towed (there were others parked there so I was assuming I was ok). Other than that, it was easy to reach and get around. One of things that I liked was the start time – 8:40am. Not sure why the odd time, but it was nice to let it get a little warmer and also not to have to wake at 4am to begin getting prepared! I honestly was not expecting that much from the expo as I have not found great expos in smaller towns (and that is what Reykjavik is) or in some international destinations (like Dubai). I was pleasantly surprised. Though parking again was a problem at the sports hall, I did find a spot and once inside, there were plenty of volunteers around to direct you where to go. Asics was the clothing partner for the race so at the door there was a race information booth/Asics race apparel booth. It was nice to be able to see what articles they were selling. Given the high cost of things in Europe (compared to the US), I was not expecting to find deals here but did notice that official race jackets (by Asics) cost $100 – which is right around the same price point as races in the US. Still too much for me, but it was nice to note that it was not a really high markup. The expo had all of the major running gear manufacturers on display- Brooks, Nike, Asics, Saucony, Adidas, Under Armour, Newton shoes, New Balance, Camelbak, etc. Many of the running shoe vendors had big sale signs displayed so I checked the prices. I was shocked by these prices – my shoe of choice (Asics Kayano) had both the last model and the current model (18 and 19). The Kayano 18 was on “sale” for $160! The Kayano 19 was being sold for $225. Now, for people that live in Europe in general and Iceland in particular, this is probably their best chance to get their running shoes on sale. But for someone familiar with bargain pricing at events in the US (I normally spend an average of $68 for my Kayanos), it was a good dose of sticker shock. The lines to get the race packets were clearly defined and I was happy there was no one in the marathon pick-up line when I made my way there. The 10K pickup had a very healthy line! After pick-up, we scanned our race chips to verify they were working and register them and then it was off with the bag to search for more goodies. The marathon entrants received a nice, colorful bag (that reminded of the bags they often sell at grocery stores) that is a nice souvenir. For me, a bag like that is more for the event than a functional bag. My favorite race bags are from the Fargo Marathon – they give really nice Adidas drawstring bags. They are really heavy duty and something I find myself using quite a bit. All race entrants received a complimentary pasta dinner. After I spent some time looking around the countryside, I came back to get the dinner. Most marathons that include dinner will have a dinner invite or ticket in the pick-up bag that you turn in when going to dinner. Not this one! They did not even have anyone checking people at the door (the dinner was upstairs of the expo). So, in reality, any expo visitor could have taken advantage of the free dinner. It was a very efficiently run meal. The lines were split off for three serving tables and the volunteers at the tables had the plates ready to go for you as you came through the line. The plate included pasta (which was actually cold) and (hot) tomato sauce with salad (no dressing) and small slices of bread. It was not the tastiest of marathon meals, but everything moved fast enough that I had my food in a matter of moments. The seating was completely full with many standing, so I stood in the corner and ate my plate before returning for one more. While it was not the best marathon meal, at least I did not have to pay for it! As I approached the starting area from my car, it was easy enough to find thanks to the loudspeakers and the crowds of runners heading that way. The starting corral was very well organized with large signs for the various paces of runners (these paces were all in minutes per kilometers). The organizers had barricades all along the starting area which kept all observers outside of the area. The main access area was from the rear but they did have a break in the barriers not far from the front that allowed racers to get out for the restrooms. They had a good number of the port-a-johns so it took me only 3 minutes in line to get to one of them. For those who wanted more comfort or a greater deal of privacy, there was access to the building that was used as marathon headquarters. 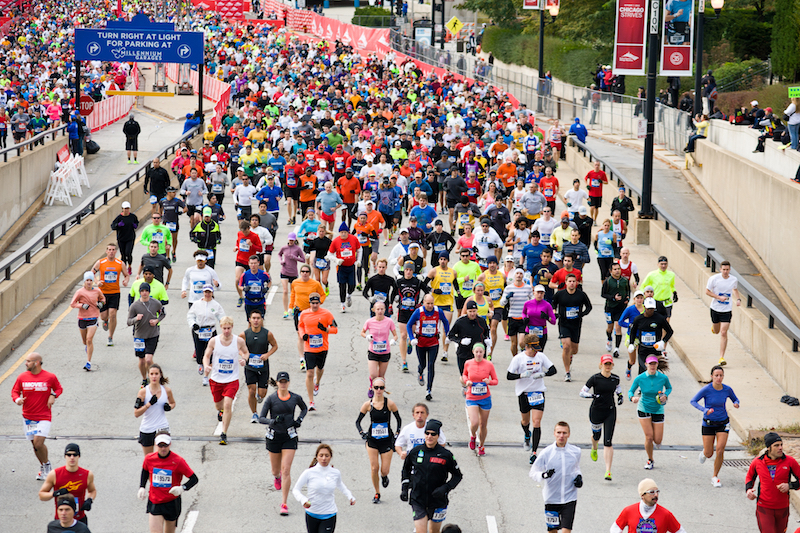 Most marathons that I have run do not start on time – they always seem to give runners some last minutes to hurry to the line. Not Reykjavik (and I say this thankfully) – they started 1 minute early! There is not much worse than having to stand in the rain longer than necessary after you have warmed up. To be able to start on time was very helpful. It took me 1 minute and 30 seconds to get to the starting line and then we were off! It was a nice sendoff by all the observers and announcers. One more cool thing – the race was started after some opening words from the president of Iceland! First time the president of a country has sent us off! The crowds were noticeable in the first few miles of the race. I was pleasantly surprised about that as it was raining and very dreary out. Yet, many spectators were out on the course, cheering us on with zeal. In addition to the spectators on the course, many families came out from their homes to cheer us on. Many came out with pans to bang to push us. Again, it was really refreshing to see so many happy faces from the porches and windows of homes waving to us as we passed. In addition to the crowds, there was a fair amount of entertainment on the course. Since the marathon course covered some of the same area twice, they set up large bandstands near where the runners would pass twice. They had about 4 bandstands and some smaller groups along the course. While I normally run with my MP3 player and do not really hear the music on the course, it is still a nice boost to see them as they are normally surrounded by small crowds that help with the runners’ pacing. I always notice my pace kick up a bit after going through these areas – not on purpose! It was advertised as a fairly flat course with some rolling terrain. Personally, I prefer a course with a slight roll to it in places as it feels better on my body than a completely flat course. A slightly varying course profile allows different muscles to come into play over the 26 miles instead of using the same muscle group the entire race. The problem with race descriptions is that descriptive language of the terrain and elevation profile tend to be somewhat subjective. Not only that, they often sound as if they were written by the tourist department of the city that is hosting the marathon! 🙂 So, it is always nice to see an elevation profile for myself to see if it is what I would call rolling terrain (I come from a place that is pretty flat). Sure enough, it wasn’t that bad at all. It did keep it interesting ! The route of the marathon was designed to go by many of the highlights of Reykjavik. If only the weather had been nice! It was overcast the entire race and drizzle that turned into rain. It really masked many of the landmarks and the beauty of the countryside. However, this country is so beautiful that it still shined through the dreary weather! Some of the landmarks that we ran by included: Höfði (a residence built in 1909 that became famous as the place that hosted Reagan and Gorbachev in 1986 as they sought to end the Cold War), The Sun Voyager (a model built to resemble a Viking ship), Grotta (a protected birdlife that possesses many species of birds as well as the most well-known lighthouse in Iceland), the Icelandic Prime Minister’s office (this was right before the finish), circling around the domestic Reykjavik airport, and many wonderful views of the Atlantic Ocean. The wind was strong enough that the waves were quite high during our passage of it. The course also went through some awesome countryside. We ran on some (asphalt) trails through some nature areas as well as running on the roads in what seemed to be grazing areas. At one point, around mile 22, we headed out for a small peninsula. I had figured we were close to reentering the city and was surprised to see the line of runners go out towards the peak of the peninsula (which led away from the city). It just appeared that it was that far because you really could see a lot father than what you are used to. The course had to be the cleanest marathon course I have run as well as having some very organized aid stations. My one gripe (which is pretty much my fault) was that the aid stations offered nothing else besides bananas and fluids (there were chocolate bars at one stop). I am used to marathons having GU gels (or equivalent) at points past the halfway mark and I was really counting on them. The morning of the race, I had searched (almost) everywhere and had been unable to find my gels. I just kept hoping they would have some out there but there was nothing to consume except the bananas. Again, my fault for forgetting where I put mine, but it would have been nice to see them out on the course. The finish line area was well-done. The crowds thickened in the closing meters and the announcers were calling out our names as we approached. I did not hear my name until I watched the video afterwards. Yes, the pronunciation was rough, but I cannot begin to pronounce many of the names there, so I’m not throwing stones! 🙂 After passing through, we were handed our medals as well as being welcome to a large pallet of water bottles. I do need to say this here – I drink a ton of water but I have never in my life had water as good as the water was in Iceland. Even from the tap! Definitely drank as much as I could! After getting our medals, the path led to the point where we took our chips off. They had volunteers to help as well as chairs to sit in if needed and buckets for the chips. After passing there, we continued on into the recovery area. This area was specifically for the marathon runners and had treatment areas, massage areas, food tables, and many other things. Unfortunately, I had to hurry through here as I needed to get back to my hotel for checkout. Altogether, it looked like a very good recovery zone. There was not a lot in the bag. There was an Asics Reykjavik Marathon shirt (I prefer the Adidas ones, but this was still nice), a certificate for a free entrance to the Reykjavik geothermal baths (only costs $5 otherwise), a free Camelbak water bottle, the marathon guidebook and that’s it! I say that in a nice way. I am split when it comes to race bags – I know that it is a great opportunity to advertise and something I have done myself but I did like that I did not have any of that in my packet this time! The medal was decent. I have had many nicer medals over the years. It was simple and had the name of the race on it. I guess that I would have liked to have seen something a little more decorative or colorful since this was the 30th anniversary race. But, it is a medal! This was a fantastic race! In the coming days, I will feature the Reykjavik Marathon in a destination report. It is one of the cities that I have run a race in that left me wishing that I had many more days in. There was just so much to see and explore. It would make a great family vacation spot and then a way to cap it off with the beautiful marathon. In addition, they have many distances – the half, the 10K, 3K, and children’s fun runs. The city is very family-friendly and would make a fine place to visit together. The people were very polite, the course was clean and beautiful, the scenes will stay in my memory for a long-time, and it was a chance to visit a place I have longed to see for a while. Would I go back? Absolutely! Just have to figure the best way to get the family there and decide at what age the kids would enjoy it the most!